“Can I fix a broken tooth at home?” This may seem like a complicated question, but there’s a simple answer: no, you shouldn’t try to do this kind of dental repair on your own. Find out why this is such a bad idea and what you should do instead, including some temporary measures that can help you feel a bit more comfortable before you see a dentist. A broken tooth, also known as a fractured or chipped tooth, can be a real nuisance. First, there’s the issue of appearance. Looking at yourself in the mirror is going to be a shock for a while, at least until you can get that tooth fixed. Plus, you can actually end up having to speak differently to avoid whistling out of the gap created by your broken tooth. Neither of these are serious issues from a medical standpoint, but they’re uncomfortable and can cause even the most modest people to take desperate action to fix the problem. 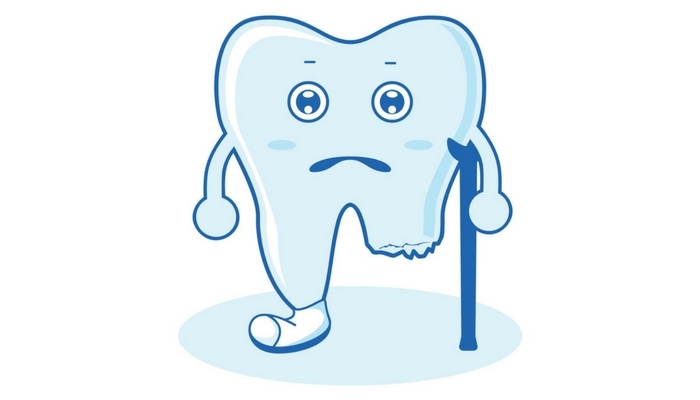 Broken teeth can pose more serious problems too. The jagged broken edge of a tooth can actually cut up your mouth. Your cheeks, lips, and tongue are actually quite delicate and a broken tooth can easily slice through this tissue, causing your mouth to bleed and creating painful cuts. 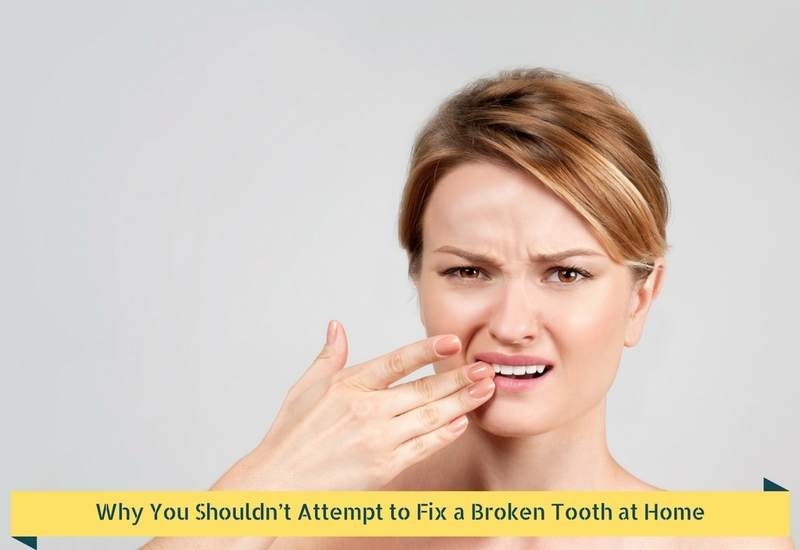 Even when the broken tooth is in a less visible location, such as the back of the mouth or on the bottom row hidden by the lower lip, this painful issue is another common motivator for those seeking DIY remedies for a broken tooth. It gets more serious from there. Broken teeth can expose the soft, sensitive material inside the tooth known as dentin. Dentin isn’t meant to be exposed. It’s supposed to stay safely covered by the hard enamel exterior of your tooth. So, if your broken tooth exposes the soft inner dentin of your tooth, you could end up with a serious infection. In most cases, broken teeth that expose the dentin require root canal treatment to remove the dentin entirely and replace it with a dental filler material. If you leave it too long, you could end up with tooth decay, an abscess tooth, gum disease, or even tooth loss. Ask any emergency dentist if they’ve ever seen a patient who’s tried to fix a broken tooth on their own and you’re likely to hear some horror stories. It’s just not a good idea to try to fix a broken tooth by yourself. Take a look at these two common things people try to do to deal with their broken teeth and find out why attempting it on your own is a very bad idea. The enamel of your teeth is very hard. It’s so hard that you’re not going to be able to smooth out jagged edges with sandpaper or a nail file. Even if you could, it wouldn’t be smart to try. First, you could end up taking off even more of the tooth than was lost to begin with. Second, you’re likely to introduce harmful bacteria to the dentin, which dramatically multiplies the chances that you’ll end up with an infection requiring a root canal. More serious grinding tools, like mini rotary tools such as a Dremel, amplify these potential risks in dramatic fashion. You may be able to grind away at the enamel on your tooth this way, but it’s a very foolish risk to take. If you didn’t have exposed dentin before you started grinding your tooth with a power tool, you probably will now that you’ve taken such drastic measures. Plus, you risk serious injury to the rest of your mouth if you let the tool slip even just a little bit. Let a qualified dental professional handle it. This is one instance in which DIY is not likely to save you any money and can, in fact, end up making the dental procedures you need to pay for even more expensive. 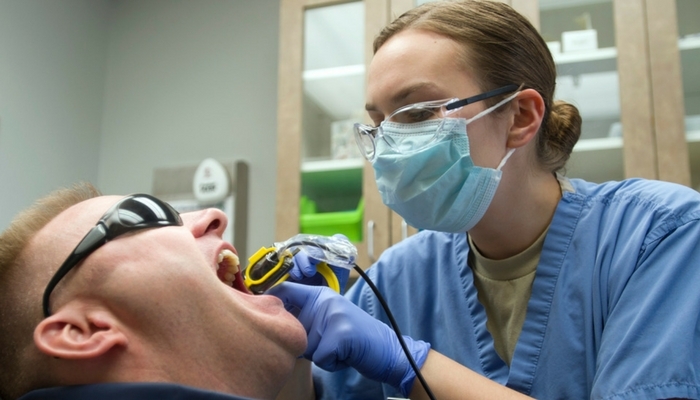 There’s a reason tooth extractions are big-deal procedures that see a dentist accompanied by a qualified nurse or hygienist and most patients put under some sort of anaesthetic. These are serious medical procedures and, if you try to perform a tooth extraction on yourself, you could end up really damaging your mouth. All it takes is one little slip of the pliers and you’ve got another mess on your hands. Aside from the potential pain you could cause and damage you could do, pulling a tooth poses a major choking hazard. Do you ever do a sudden, sharp inhalation or gasp when you experience pain? Well, if you happen to inhale just as you pull a tooth out of your mouth, you could end up aspirating the broken tooth into your windpipe. This poses both a choking hazard and a laceration risk. It’s not worth it, especially because your dentist may actually be able to save your tooth. Dental implants such as replacement teeth are a lot more expensive and time-consuming than a crown or another relatively simple fix for a broken tooth. Broken teeth can really hurt. It makes sense to want to do something about it. Your best bet is to go see a dentist as soon as possible, even on an emergency basis. If you have to wait for your appointment, you can use temporary sealants such as orthodontic wax or an over-the-counter temporary dental filling to cover the broken tooth, reducing abrasion from the jagged edge and protecting the dentin. Overall, it’s worth it to leave the treatment to the pros. Go see an emergency dentist and get that painful, annoying broken tooth sorted out as soon as possible. If your broken tooth or any nearby teeth have been knocked out of place, a dentist may be able to re-set the tooth if you get there quickly enough. Emergency dentists can seal the broken tooth and put on a temporary crown to reduce pain and restore your smile. Don’t hesitate and certainly don’t try to fix it yourself. It’s just not worth it in the long run.